Superintendent of Schools Colleen Palmer responds to allegations that the district mishandled sexual assault complaints at the Jan. 29, 2018 meeting of the Board of Education in Westport, Conn.
WESTPORT — In the wake of allegations the Westport school administrators mishandled sexual assault complaints, some feel the schools are more concerned with image than addressing the problem. Coleytown PTA Co-President Lee Goldstein highlighted two concerns she hears regularly from parents about the district. “One: The district cares more about its image than about what’s really happening. And two: When problems arise the district pays lip service instead of addressing it,” Goldstein said, during public comment of the Jan. 29 Board of Education meeting, at which Superintendent Colleen Palmer addressed the allegations of the past week. 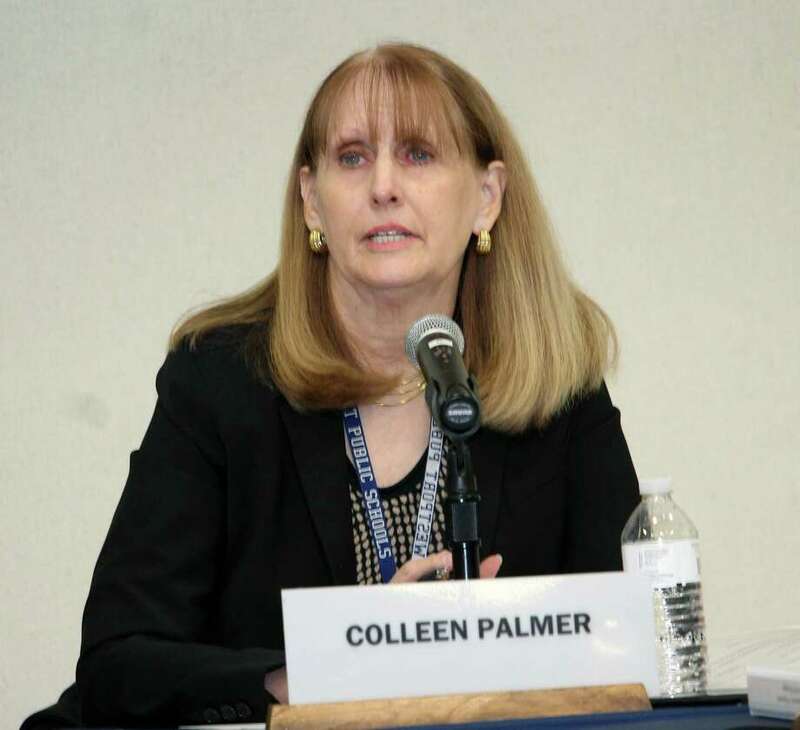 At the meeting, Palmer sought to outline the ways in which the school has worked to address the complaints lodged by students, who claimed their joint grievance, which included five girls alleging separate instances of assault by the same boy, was whitewashed and not taken seriously by administrators. “We had to all self-reflect this week and think about our work and how we need to respond to the mission of caring for our students and families. And, as we self-reflected, if our students don’t think we took good care of them then we have to do better,” Palmer said. After an internal review, Palmer said she determined the investigation into the complaints was completed “appropriately and thoroughly.” Still, effective immediately, Palmer said students seeking to file a complaint would now have a choice to speak to either a male or female Title IX coordinator, as opposed to all high school complaints going through Title IX Coordinator and Assistant Principal Richard Franzis, who handled the case referenced. Though there the only two Title IX Coordinators at the high school are male, Palmer said that a female coordinator would be moved from elsewhere in the district should she be requested. The district is planning for additional staff members to be trained in Title IX procedure later this month. Palmer also said the new regulations that better articulate what kind of behavior and physical contact between students is tolerated could be drafted within the next four to six weeks, and that open sessions would be held so that the board and administrators could receive community feedback. A third party review of procedure would also be undertaken, according to Palmer, though she didn’t give details as to when and by whom. Responding to claims from students and parents that reports of sexual misconduct were whitewashed, Palmer flatly denied any glossing over of details by administrators. Furthermore, the students who lodged the complaint, and one parent, said last week that they were never instructed to go to the police. Those involved also said that, before voiced their complaints to the school this past fall, they did not want to go to police because they feared how it might affect the future of the boy, with whom they had all been friends and with whom they still interacted to varying degrees. Both members of the board and members of the public also expressed a need to change not just policy, but the ways in which students and staff deal with issues relating to sexual harassment and assault. “I think we also want to focus on changing the culture, in terms of how do we embrace that culture,” said Board of Education member Vik Muktavaram. “I graduated 10 years ago and every year I have to read and hear about something that has happened in the school that deals with sexual assault and sexual harassment,” said Representative Town Meeting member Andrew Colabella, who said he dealt with sexual harassment at Staples as a freshman. “More needs to be done. There needs to be an intervention. There needs to be more public speaking. There needs to be mandatory assemblies. This is something that’s very, very serious. And it hasn’t just been trending this past year,” Colabella continued. Susan Carson, a mother of one of the girls who went on record last week to voice her complaints, said she was disappointed in the board and administrators for not better protecting the girls, who she said had no idea what they were getting into, or how far their words would reach, when they came to speak at a public meeting. “Now they’re being victimized in a worse way almost, all over again. Their school has turned against them. I know there is plenty of support in the community and I thank you for that. But there is plenty of backlash that’s now happening that they had no intention of doing.